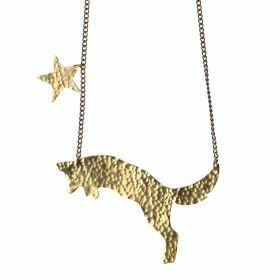 Inspired by English country gardens this leaping fox necklace is hand cut from brass sheet and planished using a specialist hammer to give them texture. Features star charm hanging from the clasp at the back. Handmade by Madhammal and her friends from Flowering Desert Project in India. Just Trade works in partnership with small fair trade projects across the world. By working with Just Trade these women are able to educate their children and secure a better future for their families.Made From: Brass with antique gold effect chain. 18" chain - Pendant 1.8" x 2.4"